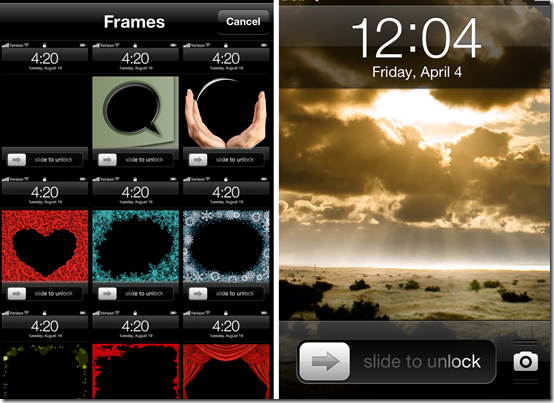 Here is a list of 5 free iPhone apps to customize lock screen. You can make your iPhone’s lock screen look cooler and different from the others. These apps can really make you stand apart from the crowd. As we all know that default lock screen of the iPhone is simple. If you want to change it then, you can only change the wallpaper of the lock screen and that too sometimes doesn’t fit perfectly on the screen. The lock screen apps mentioned in this article will help you in getting rid of these problems. First, these apps will provide you with really cool wallpapers for applying to lock screen and the second thing is that you don’t have to worry whether they will fit the screen or not. 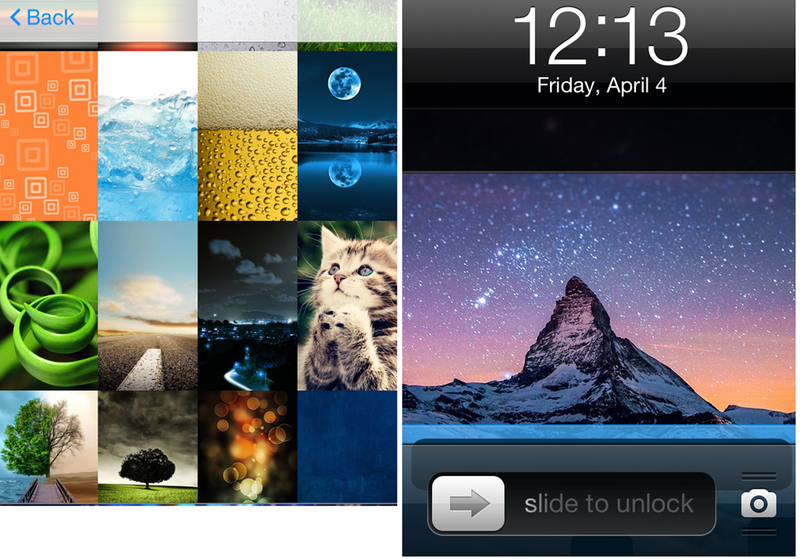 The first lock screen customization app for iPhone is FancyLock. This app has various lock screen themes which even changes the appearance of your iPhone’s lock slider. You have to use your own images to decorate the background as this app doesn’t provide you with default background wallpapers. Once you have added the photo, then you can choose from various lock screen themes. The app has 4 themes absolutely free while the rest of them can be unlocked either by purchasing the paid version or by collecting coins from within the app. Weather Lock Screen is one of the most coolest lock screen customization apps in this list and its also my favorite app. This app displays the current weather as well as 4 days weather forecast to you on the lock screen. You can choose to see the weather info of either your current location or any other location in the World. 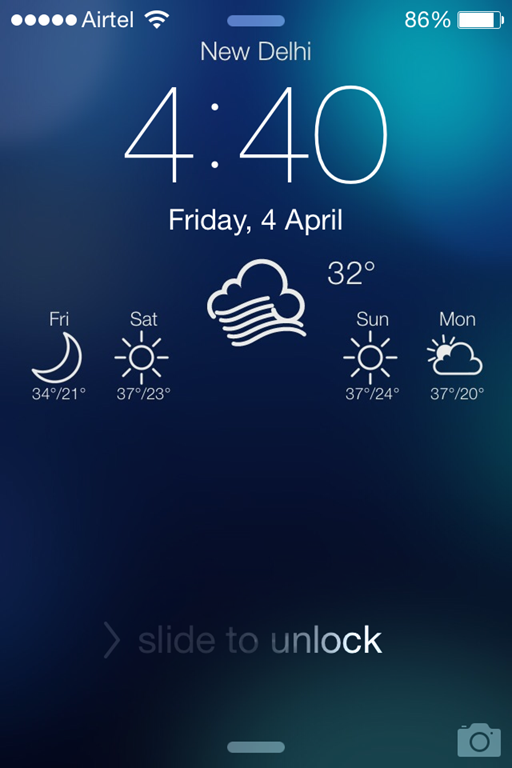 The app has 6 different styles for you to choose from for displaying the weather forecast on the lock screen. All of these styles are cool and you will be confused in picking one of them. The only thing that I missed is that it doesn’t update the weather automatically on the lock screen. For updating the weather, you have to go to the app each time and then reset the wallpaper. 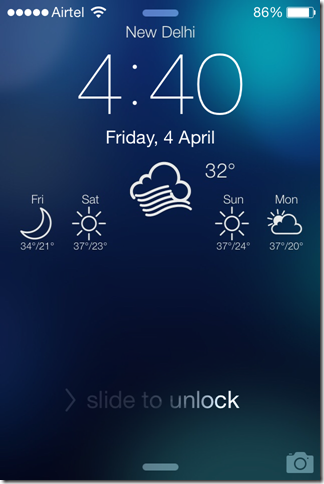 Get Weather Lock Screen here. The next app to customize lock screen is LockScreen for iOS 7. Don’t worry, its just the name otherwise this app also works on older devices. You can choose for wallpapers either from your collection or from the app’s in-built collection. The app has a large collection of cool wallpapers to customize and enhance the appeal quality of your iPhone’s lock screen. The app lets you customize the appearance of upper (area where you see the date/time) and lower part (area where slider for unlocking iPhone is present) of your locker screen. When you have customized the wallpapers then, simply save it and flaunt it. 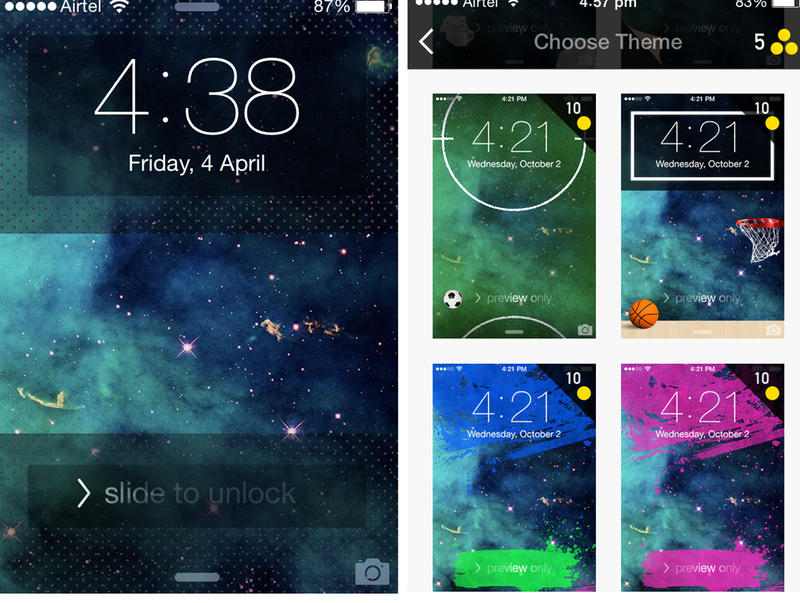 Get LockScreen for iOS 7 here. The fourth app for customizing your iPhone’s lock screen is Lock Designer Free. This app lets you select the wallpaper image, frames, and add decorations for customizing the lock screen. In the free version, the app provides you with 78 different skins for you to choose from. All of the skins are so good that you will be spoiled for choices. When you have selected the skins, its time for selecting frame. You have got 37 frames to choose from. You can also skip the frames if you don’t want to apply one. The unique feature of the app is Decorations. This feature lets you add smileys and notes to your wallpapers but this feature only works for the wallpapers imported by you from your collection. Get Lock Designer Free here. The Cal+Lock Wallpaper is a quite different lock screen customization app for iPhone. This app displays a calendar on your lock screen with all your events being marked on it. Isn’t it cool that you can check all your events directly from the lock screen. 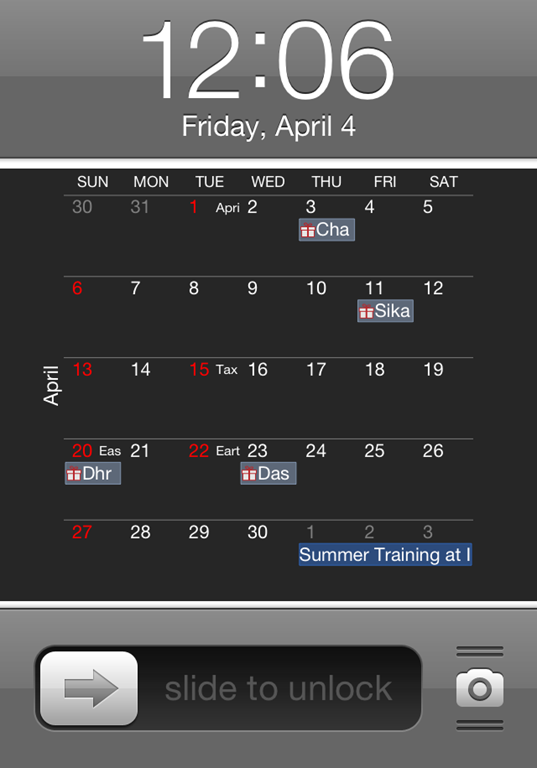 The app lets you customize both calendar as well as the events to be shown on the lock screen. 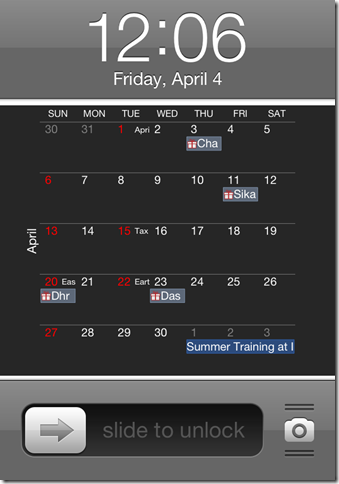 You can choose which events will be displayed on the calendar and from which calendar app, installed on your iPhone, these events can be imported. You can choose to display all events, birthdays, or simply anniversaries. If you want to add any image from your collection then you can also do so. The app also has features for customizing the colors, opacity, and fonts of calendar but this feature is available only with paid version. These were the 5 free iPhone apps to customize lock screen. Try out the app which helps you in increasing your style quotient and makes you appear coolest guy in the circle. You can also share the name of the app which you liked the most with me.